The Easter Islanders were more cutoff from the world then ever before. Any dreams of escaping the destroyed island were dashed by the lack of wood. The only boats they could build were small rafts and canoes made of tortoro reeds. Even fishing must have become extremely difficult at this point. The island was a wasteland, the eroded soils just barely producing enough food for the meager population to survive. It was under these conditions that the Birdman Cult arose. It's possible that the Birdman practices has been going on during the reign of the statue cult, however, it eventually took over as the predominate religion on the island and was still in practice up till 1866-67. 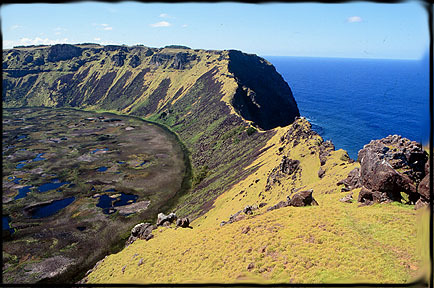 High on the rim of the crater known as Rano Kau was the ceremonial village of Orongo. Built to worship the god of fertility - Makemake, it became the site of a grueling competition. Each year leadership of the island was determined by the individual who could scale down the vertical slopes, swim out to one of three small islets in shark infested waters, and bring back the egg of the nesting Sooty Tern unbroken. The one who did this successfully was considered the Birdman of the year and was bestowed with special honors and privileges. One of the most fascinating sights at Orongo are the hundreds of petroglyphs carved with birdman and Makemake images. Carved into solid basalt, they have resisted ages of harsh weather. It has been suggested that the images represent birdman competition winners. 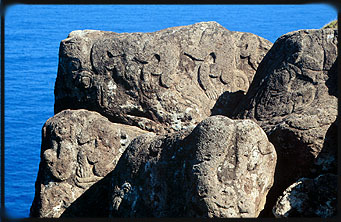 Over 480 birdman petroglyphs have been found on the island, mostly around Orongo. 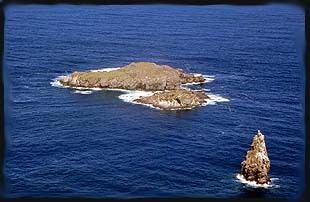 As birdman images transformed the rocks so to were the islanders transformed. It seemed that the culture was beginning to rebuild itself. We will never know whether the Rapa Nui would have survived and prospered because in 1862 wave after wave of slave traders landed on Easter Island and took away all healthy individuals. In the space of one year, a level of injury, death and disease was inflicted on the population leaving a broken people, bereft of leadership. As their culture lay in disarray a new force entered the seen whose actions would forever deny the world of a true understanding of the Rapa Nui culture. The missionaries arrived on Easter when the people were at their most vulnerable. With their society in ruin it did not take long to convert the population to Christianity. First to go was the islanders style of dress, or lack of. Tattooing and use of body paint was banned. Destruction of Rapa Nui artworks, buildings, and sacred objects, including most of the Rongo-rongo tablets - the key to understanding their history - was swift and complete. Islanders where forced off their ancestral lands and required to live in one small section of the island while the rest of the land was used for ranching. 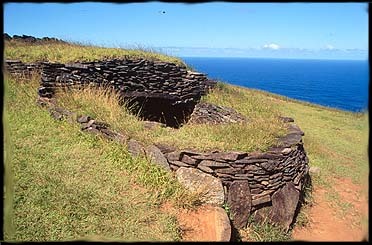 Eventually all pure blood Rapa Nui died out. Annexation with Chile brought new influences and today there are only a few individuals left with ties to the original population.